Old Elizabethan Professor P J Rhodes, a leading ancient historian, highlights a QE connection in a new academic tribute to one of the world’s foremost experts on Greek art. 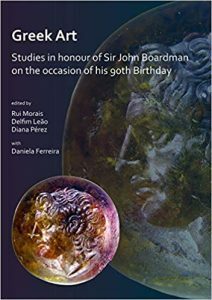 Peter John Rhodes (OE 1951–1959), who is usually cited as P J Rhodes, has penned a chapter entitled Buildings and History in a festschrift published this spring, Greek Art in Motion: Studies in honour of Sir John Boardman on the occasion of his 90th birthday. 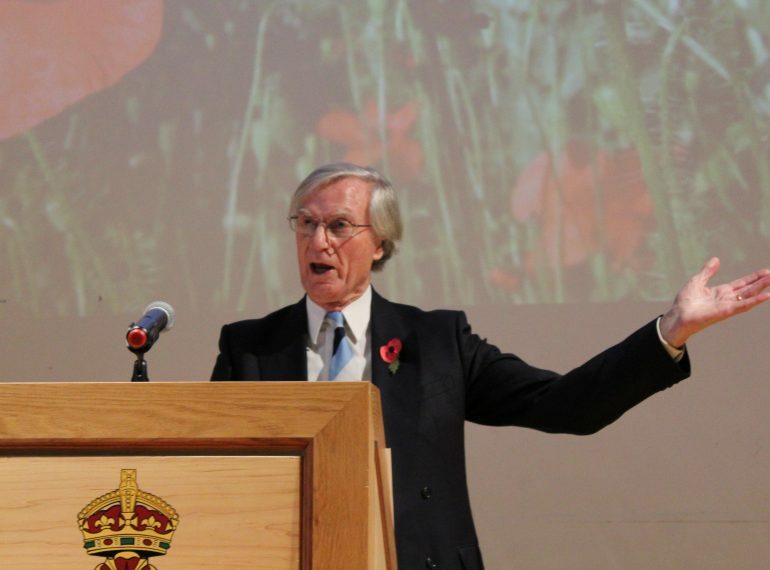 In the chapter, Professor Rhodes, who is Honorary Professor and Emeritus Professor of Ancient History at the University of Durham, mentions that one of Sir John’s contemporaries at Chigwell School was J W Finnett. 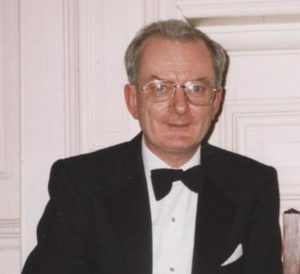 John Finnett went on to become a popular Classics master at QE, teaching Professor Rhodes when he was in the Sixth Form. 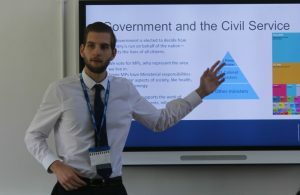 He has also been inspired recently to look further into the history of Classics teaching at QE. In an article for the Old Elizabethans Association’s magazine, the Elizabethan, he charts the fluctuating fortunes of Latin and Greek at the School across the centuries, as well as recording his own memories of his teachers in these subjects. He was at QE during the last of E H Jenkins’ three decades as Headmaster and was in the last year of two-form entry (60 boys) before the post-war expansion. The senior Latin master in that era was Percival Timson, who had been at the school since 1935. John Finnett joined QE in 1951, aged 23. 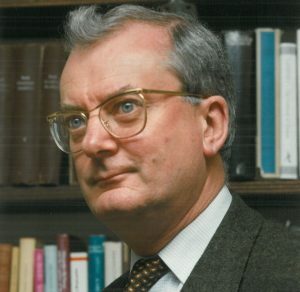 Professor Rhodes is the eldest of three brothers, of whom the youngest, John Andrew, also went to QE and later became a modern historian at Wadham College, Oxford (to which Prof Rhodes went as an undergraduate). He went to Durham as a young lecturer in Classics in 1965 and rose to become, firstly, a senior lecturer, and then, in 1983, Professor of Ancient History there. He retired in 2005 and still lives in Durham. During his career, he has published extensively on the Classical Greek world; his works span the decades, from The Athenian Boule, published in 1972, to a forthcoming edition of Herodotus, Histories, V.
He has held a number of visiting fellowships; Wolfson College, Oxford (1984), University of New England, Australia (1988), Corpus Christi College, Oxford (1993), and All Souls College, Oxford (1998). He served as President of the Classical Association from 2014 to 2015. In 1987, he was elected a Fellow of the British Academy and in 2005 was made a Foreign Member of the Royal Danish Academy. In the mid-2000s, soon after his retirement, the then-Headmaster, Dr John Marincowitz, told him on a visit to the School that he hoped to reintroduce Latin soon. Professor Rhodes has been heartened to learn not only that this was subsequently done – it is now a curriculum subject – but that Greek is today also available as an extra-curricular subject. 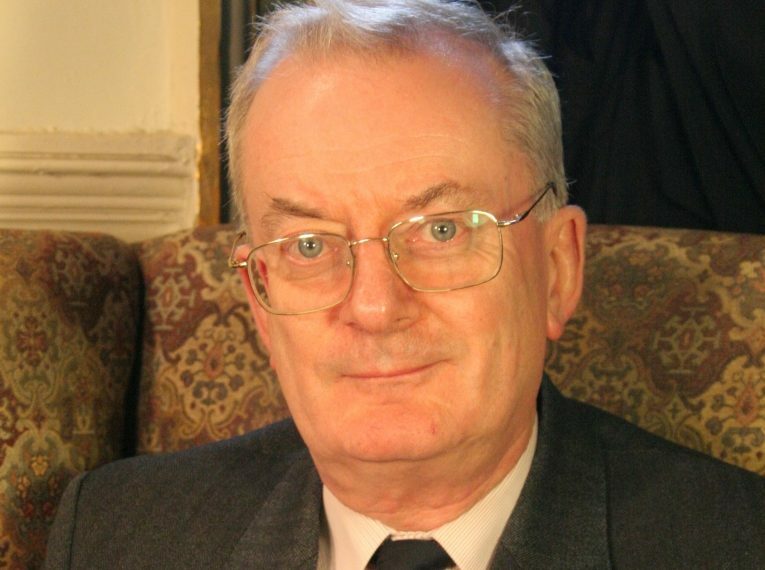 It is with regret that the Association announces the death of Ron Middleton who passed on 5 March 2019. Funeral details have been circulated by email. It is with regret that the Association announces the death of Maurice Glassman who passed on 15 January 2019. It is with regret that the Association announces the death of Mike Back who passed in early 2019. It is with regret that the Association announces the death of Roy Hatton who passed on 18 December 2018. 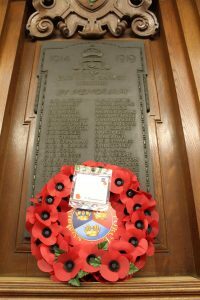 If you wish to join the 200 Club, which costs £12 a year and supports the Memorial Playing Fields and the School, contact Martyn Bradish at mb@bradish.co.uk . 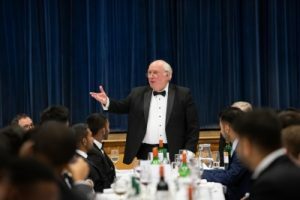 The 123rd Old Elizabethans Association Annual Dinner brought together old boys of all eras for an evening offering both formality and fun. 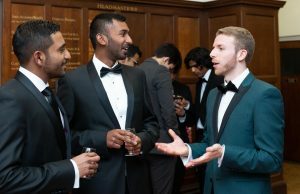 The evening featured the customary speeches and time-honoured toasts, but there was also opportunity aplenty for alumni to chat with old classmates and strike up new friendships in a relaxed and convivial environment. 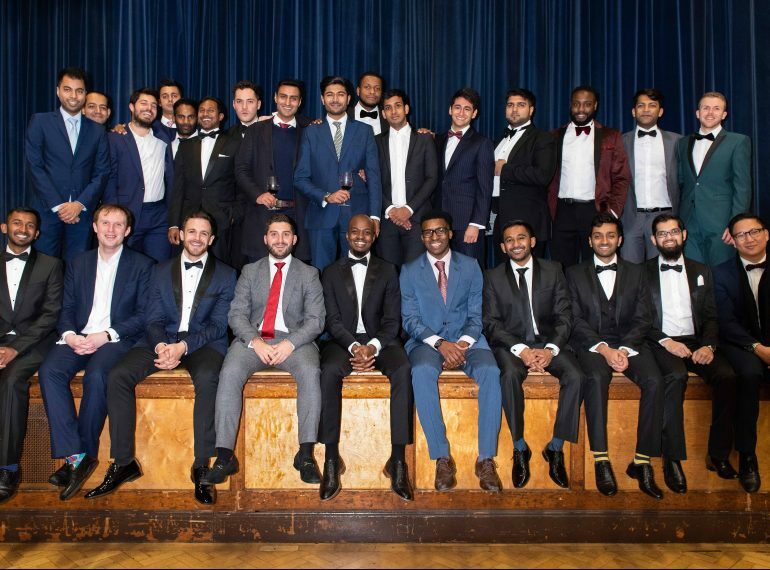 As is usual at the dinner, there was a particularly strong turnout from the ‘ten-year leavers’ – those who started in Year 7 in 2002 and will therefore mark ten years since they left the School in summer 2009 at the end of this academic year. 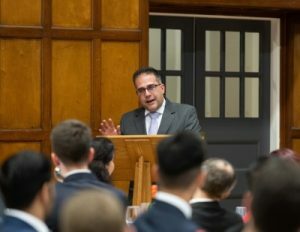 Guest speaker Alan Ingham (OE 1987–1994) entertained his fellow alumni with his recollections of School life during an era of great international uncertainty, recounting the confident prediction of one teacher that the Berlin Wall would not fall in his lifetime – just months before it did. Ala n, a senior software developer with electronic trading company Nex Group, attended with his fiancée, Ana Maria Soler Castells, whom he was marrying on the following day. 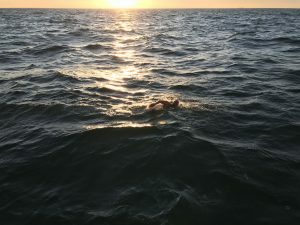 He had, therefore, been very busy in the run-up to the dinner, he said, but added that the resilience one learns as a QE boy had stood him in good stead as he strove to cope with these competing demands! 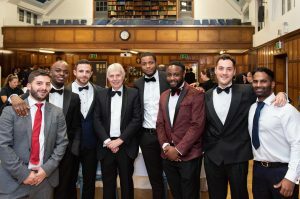 Reflecting on the evening afterwards, Headmaster Neil Enright said: “There was a lovely atmosphere at this dinner – a reflection, I am sure, of the increasing connections being made by our alumni both with each other and with the School. Mr Enright reserved a special welcome the ten-year leavers, the class of 2002-2009 (or 2002-2007 for those who did A-levels elsewhere). 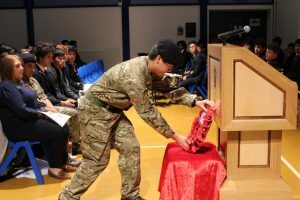 They were, he said, a “fun, friendly and very successful cohort”, noting that they had started at QE on Monday 2nd September 2002, thus coinciding with his own arrival as a young teacher. Those from this group who attended the dinner included Commonwealth Games triple-jump finalist Nathan Fox and George ‘the Poet’ Mpanga, the high-profile spoken-word artist who spoke in front of the Queen on Commonwealth Day and who performed a specially commissioned poem as part of the international TV coverage of Prince Harry and Meghan Markle’s wedding. 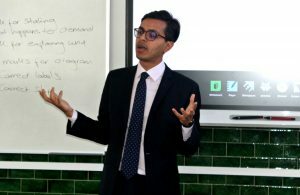 The Headmaster outlined a number of “big themes” which are currently being considered as part of the School’s long-term development. 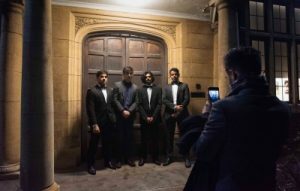 One of them is “keeping in touch” – which includes drawing on the experience and insight of OEs to assist current boys, many of whom are the first in their families to apply to top universities or to try to enter the most competitive professions. The formal proceedings included toasts to Queen Elizabeth II and to “the pious memory of Queen Elizabeth I” (by tradition, honoured in silence). 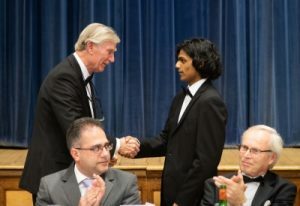 School Captain Aashish proposed the toast to the association, with the response given by the association’s Chairman, Martyn Bradish (OE 1962–1969). This was followed by the toast to the School proposed by guest speaker Alan Ingham, with the Headmaster giving the response. 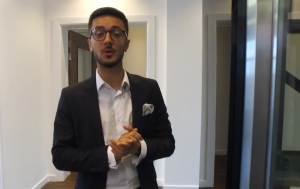 Aas hish hopes to study Neuroscience at university and has already prepared for this by undertaking work experience in local hospitals and by examining neurological ways of treating depression in his Extended Project Qualification dissertation. The guests enjoyed a smoked salmon rillette with pickled beetroot and pea shoots and a main course of roast belly of pork with roasted new potatoes, followed by Eton Mess for dessert, topped off with coffee and mints. It is with regret that the Association announces the death of Jim Winchester who passed on 18 June 2018. It is with regret that the Association announces the death of Tim (Torj) Herbert who passed on 25 June 2018.